Coleoftheball: #Ablogadayforthewholeofmay Day 8 - Catherine on Micellar waters. #Ablogadayforthewholeofmay Day 8 - Catherine on Micellar waters. Enjoy Day 8 it's a good one! I'm Catherine and I write over at http://www.beautyisintheeyeofthebeholder.co.uk a beauty, plus sized fashion and lifestyle blog, I was very flattered when Nicole asked me to guest post on her blog, I love and read her blog all the time! micellar waters, they have been the buzz word around the blogging world for the past two years the biggest one with the most hype being of course bioderma micellar water! 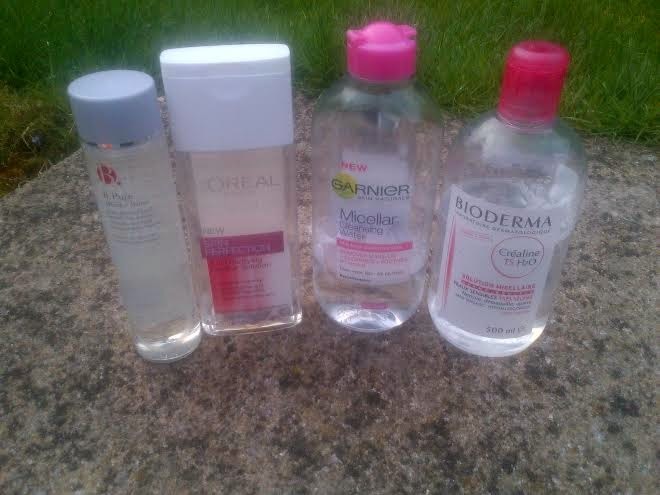 until a few weeks ago I had never tried bioderma micellar water, but now that ive tried the top 4 micellars out there what to do but a micellar off? so shall we start with the stats? bioderma sensibio H20 500m l- have been unable to find the exact price, around £16.00. 250ml can be found at escentual, but 500ml is amazon only from what I can find. garnier micellar water 400ml - £4.99, but often on offer. the best one for value. L'Oreal paris perfecting 3 in 1 micellar solution 200ml - £4.99 but often on offer. AQUA/WATER, HEXYLENE GLYCOL, GLYCERIN, POLOXAMER 184, DISODIUM COCOAMPHODIACTATE, DISODIUM EDTA, POLYAMINOPROPYL, BIGUANIDE. b. pure micellar water 150ml - £4.99 but almost always on offer for half price or less. AQUA, PEG-6 CAPRYLIC/CAPRIC GLYCERIDES, BUTYLENE GLYCOL, POLYSORBATE 20, PENTYLENE GLYCOL, CUCUMIS SATIVUS JUICE, CAPRYLYHYDROXAMIC ACID, PHOSPHORIC ACID, SODIUM BENZOATE, POTASSIUM SORBATE, SODIUM SULFITE. so, how do they preform? no smell, like water, removes face makeup nicely, but heavier eye makeup it struggles with leaving grey smudges. no smell, like water, removes face makeup but takes a few goings over, can remove light eye makeup, but leaves a lot of heavy makeup. no smell, like water, removes face makeup easily, struggles with heavy eye makeup leaving grey smudges. no smell, like water, removes face makeup easily and eye makeup, even heavy is ok, takes a little bit of work. so, we know there stats and how that work so? b beauty was the first one I tried, and personally my favourite, as I have also now gone cruelty free that's even better as the rest are not cruelty free. bioderma, loreal and garnier are all owned by loreal and that is obvious because they all act basically the same and have basically the same ingredients. personally id always go for b beauty. what about you? whats your favourite? I love the Garnier Micellar Water as it really leaves me feeling fresh and clean with hardly any effort.